Cylinder manufacture located in Tainan city. 1. We are a certified high pressure cylinder manufacture by the US DOT- Department of Transportation & Canada TC-Transport Canada. We also approved by ISO 9001: 2015 management certificate. 2. We has professional inspection and production equipment, and we train professional and outstanding technical team. 3. We also have authorized inspector on site by the US Authorized Testing Inc. to ensure every production stage has met the best quality level. 4. 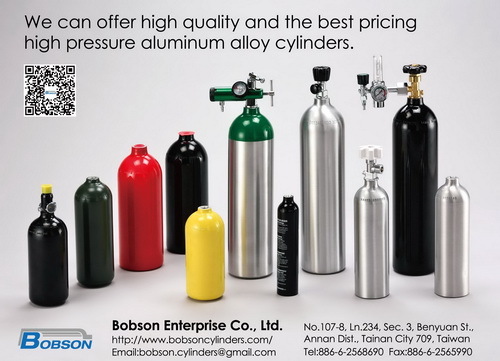 We are expanding our specialty product lines for, medical oxygen cylinders, paintball tanks, and soda water CO2 tanks, fire extinguisher CO2 tanks, Scuba cylinders, and many more OEM / ODM high pressure cylinders. 5. We can offer high quality and the best pricing high pressure aluminum alloy cylinders. agent to find more business in the world. We are sincerely hoping to serve you in the future.